INCLUD-ED’s has identified Successful Actions with universal components transferable across contexts. The implementation of these universal components during and after the INCLUD-ED’s Project in different territories has obtained relevant social impacts. That is, improving educational outcomes, enhancing social cohesion or increasing opportunities and quality of life for the population from the point of view of economic development (creating new jobs or identifying actions that generate new jobs) and quality of live. These social impacts have been achieved through the communicative research perspective that allowed a direct and active participation of the people whose reality was being studied throughout the entire research process. Their voices have been taken into account in order to contribute to overcome their difficulties. Evidence: Overcoming of the absenteeism (from 30% to occasional) in 3 academic years. La Paz Primary School (highly deprived area, Albacete). Evidence: Overcoming of the absenteeism (from 60% to occasional) in 1 academic year. Mediterrani School (highly deprived area, Tarragona). Evidence: High increase in the score in La Paz Primary School (highly deprived area, Albacete). 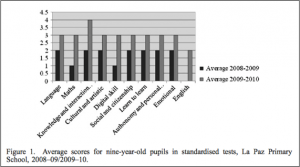 Increase of the scores in all subjects in standardized tests in one academic year (9 year old students). Increase the scores in mathematics from 1 to 3 (out of 5) in the standardized tests. Increase the scores in cultural and artistic skills, social and citizenship skills, learning to learn, autonomy, and emotional skills from 2 to 3 (out of 5) in the standardized tests. The percentage of children perceiving that they had improved ‘very much’ in mathematics increased from 63.89% to 94.59% from 2006-2007 to 2009-2010. Evidence: Increase of the scores in a school with high rates of migrant students. Increase in the percentage of students who pass the official exam on reading skills: from 17% to 85% in 5 years (2001-2006). The school has scored above the average grade at the regional standardized test on language skills in English (2010-2011). 100% of students pass the listening skills exam (2010-2011). 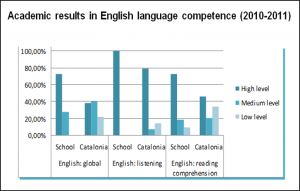 Evidence: High increase of the scores in a school with high rates in Roma student population (Catalonia). Increase of a 58,95% in the percentage of students who achieve read and write skills in pre-primary education (5 years old) in 2012-2013. 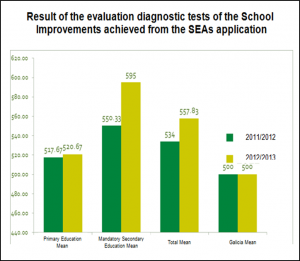 Evidence: Increase of the scores in Alberich i Cases Primary School (Middle-Class Schools). Score above the average grade at the regional standardized test overpassing by 4.9% the results in Catalan language, by 6.5% in Spanish language and by 4.8% in mathematics. The average of 6th grade students obtain 92.5 points in the standardized tests in mathematics in the 2011-2012 academic year. In the same period the students with special educational needs are increased by 11%, and foreign students in a 10%. 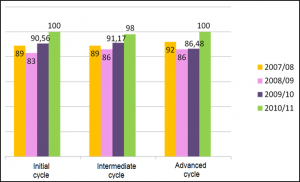 In 2010, all students completed the initial and advanced cycle and 98% of students completed successfully the intermediate stage. Evidence: Increase of the scores in a Rural school, North of Spain (in Castroverde Pre-school and Primary School). The school has scored above the average grade at the regional standardized test both in primary education and secondary education in 2011and 2012 academic years. Evidence: In 2014, there are more than 200 Learning Communities, schools that are implementing SEAs, after the INCLUD-ED Project. Evidence: Approximately 70 schools in Brazil and 23 schools in Peru, Mexico and Colombia are implementing SEAs (promoted by Natura Institute). Evidence: More than 50 parent’s associations in Catalonia are implementing SEAs through the Xarxa-Clau Project (developed by the Federation of Parents’ Associations of Catalonia, FaPaC). Evidence: 586 jobs in one of the poorest neighborhoods in southern Europe (Miguel Fenollera cooperative), 10 permanent positions in the cooperative, 570 contracts in the agricultural sector and 6 in the educational sector. 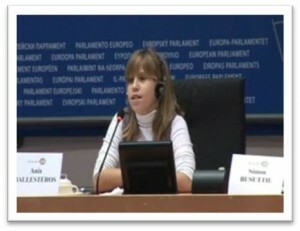 A 10 year old pupil from a school with high rates of migrant pupils explained in the European Parliament her own and her classmates’ experience with Successful Educational Actions (SEAs). As Ania shows in the video: they learn more and they are more united. 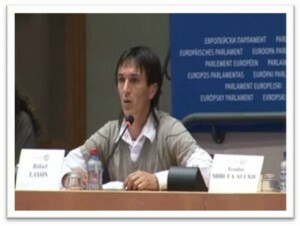 Mr. Rafael Layón, current member of the Miguel Fenollera Cooperative and neighbour in one of the poorest neighbourhoods in southern Europe explained his own experience in overcoming exclusion through SEAs during INCLUD-ED’s Final Conference. As he explains in the video: he and other neighbours have overcome situations of extreme vulnerability after participating in SEAs.